Let me begin by conveying my deepest sympathy on behalf of the Government and people of this Territory to you Mrs. Tarabay, your three sons Mohammed, Khalid and Ibrahim, your extended families and to the entire Lebanese community on the passing of this great man, your husband, father of his three boys, father to the Lebanese community and our friend Mr. Ali Tarabay. My heart has been heavy with a great sadness since yesterday morning when my wife, Lorna woke me up with the news that Mr. Ali had passed. But today we thank God for Mr. Ali's wisdom that he shared with so many of us, for his generosity, for his vision, for his passion and for his compassion. We thank God that Mr. Ali came to live amongst us some fifty years ago and helped to make our beloved British Virgin Islands a better place. I am deeply honoured to have been invited to pay tribute to this Icon at this final farewell to him. Despite the heaviness of all our hearts we celebrate Mr. Ali's full and hugely productive life: as I reflected on this great man, as I trolled through the many tributes that poured in on social media in particular, my thoughts were: here was the BVI's unique credit card before we ever heard the word, here was our own Macy's , our own Sears Roebuck, our own JC Penney's! Indeed there were earlier Lebanese door to door salesmen who could make the eyes of our parents pop, as well as ours as youngsters, but Mr. Ali was in his own league. 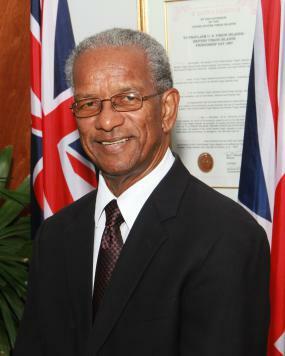 He not only made our eyes pop, but he was a man who really cared about the welfare of BVI families. We all remember his famous copy books in which he inserted what was bought and how much was owed etc. We know that it was not the cost of the goods that mattered to him, but how much our parents could afford! We all have our own stories about Mr Ali. And so today we celebrate his compassion. When he opened Tortola Department Store in 1971 we all rejoiced. We could shop in comfort for shoes, clothing, hats, underwear - you name it. And don't talk about Christmas, as our homes were all adorned with his curtains, drapes, floor coverings - all at an affordable price. His business relationships with us were built on trust and honesty which was reflected in the introduction of layaway plans to meet the financial needs of this community. Mr. Ali practiced Business 101: know your customer, with the first rule being know your customer's name, then be warm, courteous, patient and respectful. And so we all felt special doing business with him. Then along came his nephews Omar and Mohammed Tarabay whom I am sure he encouraged them to open their own store, the Royal Shop after they too spent some time doing their door to door selling. What was great about Mr. Ali was that if he did not have what we needed he never failed to say try Royal Shop - or any other shop in Road Town for that matter. Many other Lebanese stores sprouted up in the Territory after Mr. Ali set up the Tortola Department Store. I know that many learnt from this ultimate entrepreneur not only how to be good business men but how to be good BVI citizens. Today that community has moved beyond clothing to electronics, IT, you name it - all because of Mr Ali. He had this deep desire to see commerce thrive in the BVI. Indeed this Territory must ensure that Mr. Tarabay’s legacy lives on by practicing the business management skills he exemplified, and lived by – hard work, honesty, trust, excellent customer service, staying in touch with the customer’s needs and recognising when to re-invest and upgrade the business offerings. There are many charities in this Territory today. I don't believe that there is one that sought Mr. Ali's support that he did not respond positively to by giving as much as he could. Indeed he lived by the mantra found in Holy Scripture that it’s better to give than to receive. And this was the essence of his greatness! I know that Mr. Ali established the Islamic society and members of the community - from the Muslim world as well as members of the wider community of a similar faith not only learned from him, regularly consulting with him as one of the founding fathers, president and a leader. As a senior Imam he is irreplaceable and will be sorely missed. I cannot end without paying tribute to his immediate family - his wife Miriam and three sons who have always exemplified many of their late husband and father's qualities - especially his humility and his compassion. I expect that you will help this Territory to carry on the great legacy left by Mr. Ali. Indeed the BVI is a better place because Mr. Ali Tarabay passed this way. May his soul rest in eternal peace.